Vancouver, British Columbia--(Newsfile Corp. - January 8, 2019) - TerraX Minerals Inc. (TSXV: TXR) (FSE: TX0) (OTC Pink: TRXXF) is pleased to announce that 2018 exploration programs delivered concrete advancement of targets at the Yellowknife City Gold (YCG) project. While continuing to deliver high grade surface results, TerraX compiled and enhanced all data sets to achieve a clearer understanding of the deposits. Analysis and review of the entire district by a panel of internal and external global experts has identified new targets and further defined existing ones. 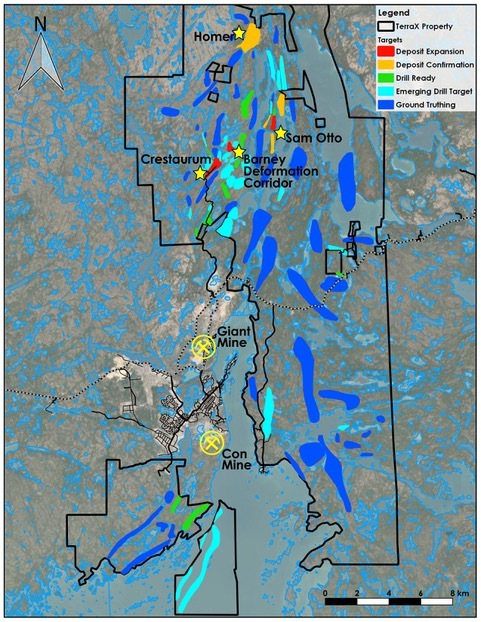 David Suda, President and CEO stated: "The Yellowknife City Gold Project continues to emerge as a globally significant exploration opportunity due to it's district scale, infrastructure and proximity of targets to historic gold producers Con and Giant. The outcome of targeting has brought about an exciting turning point for TerraX. Most importantly, this work provides context for gold findings on and below surface to date and sheds light on new un-drilled opportunities that lie within our existing core focus areas." Identifying targets included the analysis and prioritization of over 100 prospective areas Figure 1 on the property. These targets were scored based on a rigorous classification of their exploration stage, their potential, and the level of confidence from the information currently available Figure 2. Four top priority targets were flagged for deposit expansion or confirmation drilling. Joe Campbell, Executive Chairman stated: "Equally exciting is the identification of several new high potential early stage targets that require additional exploration work. 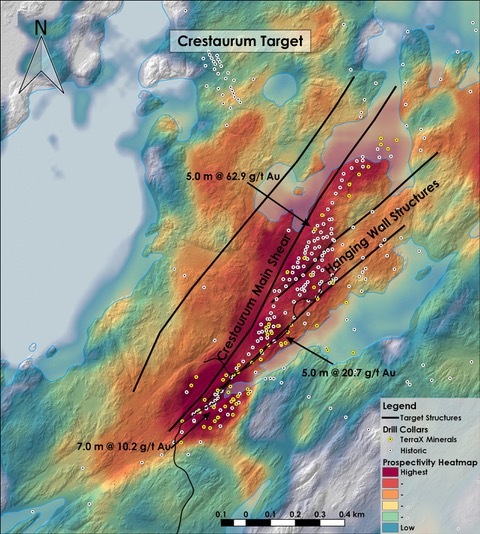 These targets are parallel structures to the shear that produced 5+ million ounces of gold at the Con mine." 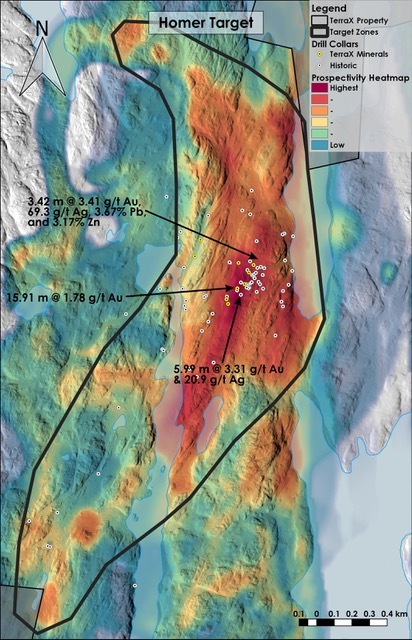 Homer Figure 7 is a 2km long and nearly 1km wide target with confirmed strong mineralization on surface. Pathfinder elements and felsic intrusions related to gold mineralization are contributing vectors that make this a very exciting target. This is one of TerraX's largest mineralized zones, and there is potential for economic gold bearing shears.